A counterfeit money detector is a handy device that allows you to determine whether or not a bill is a counterfeit. It can help you avoid substantial monetary losses to your business or organization, too (Source). Dealing with hard cash is risky. There’s always a chance that someone will try to trick you into taking counterfeit money. Sometimes, you’ll be able to spot a fake right away. Good fakes, however, might need a counterfeit money detector. A good counterfeit detector is portable, easy to use, and can process large amounts of money. It should incorporate the type of detection technology that best suits your needs as well. Most importantly, it should be affordable, especially if you need several units. Finding a good counterfeit money detector can be difficult. Hence, to help you find the right detector for your business, here’s a list of the top five models and how to choose one. If you’re looking for a decent detector but your budget’s a bit tight, look no further. The Carnation CR180 is one of the best detectors you can find under $200. It’s a reliable option for those who don’t have much to spend. 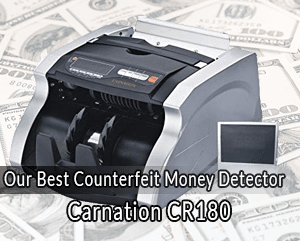 Notably, when it comes to detecting counterfeit bills, the Carnation works just as efficiently as more expensive models. It utilizes two different methods of detection: UV and MG technologies. Moreover, it can count up to 1000 bills per minute, which is means the Carnation can save you quite a bit of time. You can also set the detector to auto-stop when a certain preset count is reached. Additionally, its display is external and it comes with a one-year warranty. Therefore, this detector is a great choice if you’re looking for durability, reliability, and efficiency at a great price. If you’re not looking for a money counter and simply want something to spot fake bills, the Cassida Uno is a great choice. It gives you immediate results thanks to its IR technology. It looks for certain state-of-the-art IR security markings that are invisible to the naked eye. These IR features are some of the most advanced security measures there are and they have yet to be beaten. As complicated as the technology is, the method itself is actually quite simple. If the detector finds IR stripes on the bill, it’s legitimate. If there aren’t any stripes, then it’s a counterfeit. When that happens, the detector displays the results on a 4-inch LCD screen. There are only two downsides to this detector. First, it doesn’t count money. Second, you have to scan each bill individually. This, of course, takes time. If you’re looking for a detector that is trusted by banks and credit unions, then look no further. All kinds of financial institutions rely on the Carnation CR2 when it comes to detecting counterfeits. The Carnation CR2 utilizes three different detection technologies when screening your bills: infrared, magnetic, and ultraviolet. There’s practically no chance that any counterfeit bills can get past this detector. Additionally, it is touch screen and supports computer connectivity alongside its automatic three-speed 800-1500 banknotes per minute. Overall, the Carnation CR2 might be a bit expensive, but the features and technologies it has to offer are definitely worth it. The last detector from Carnation was pretty good, but it’s not as impressive as this one. With this model, the company takes things up a notch. On the other hand, you most likely won’t choose this detector unless your business handles huge sums of money. It is specifically made for large businesses, casinos, and banks. Notably, this machine handles mixed denominations. You won’t have to sort out your tens, twenties, and hundreds: Just put all the cash right into the detector and let it work its magic. The Carnation CR1500 will automatically sort and total the bills for you, too. It’ll also check every single one for counterfeits. It relies on MG, UV, IR, and image and size recognition technologies. However, that’s not the most amazing part yet. It’s this: this detector can capture and store the serial number of every bill that passes through it. Alongside that, it supports non-stop counting with reject pocket, an easy software upgrade via SD card or USB port, and PC and printer connectivity. Although the Carnation CR1500 is a bit expensive, it’ll definitely save larger businesses a large amount of money. 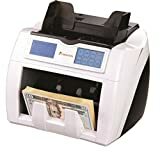 If you’re looking for a small counterfeit money detector to place right next to a cash register, this is a perfect choice. It may not count money, but it definitely excels at detecting fake bills. 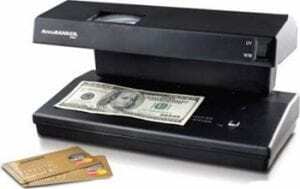 It utilizes magnetic and infrared technologies to check bills for counterfeits. The process takes less than a second, too. The only downside is that it’s time-consuming, as each bill has to be inserted individually. A counterfeit money detector is meant to help you avoid being tricked. It’ll save you money, time, and effort. It’s fairly obvious that whenever you buy something, it should suit your needs. But what does that mean? Doesn’t a counterfeit money detector just “detect” fake bills? Well, yes. But some detectors can go further. Some counterfeit money detectors can help you screen traveler’s checks, passports, and ID cards. All of these can be faked and depending on your business, you might need to check their authenticity every now and then. Think about what you need the detector for. If money is your only concern, then don’t spend extra on more fancy detectors. But if you’re going to be dealing with more than money, consider higher-end detectors. Ideally, you want to look for something that offers convenience and ease of use. This is especially important if you run a busy store with lots of clients going in and out on a constant basis. You don’t want a detector that’ll waste time. Clients and customers are always impatient and never want to wait for long to be served. After all, time is money. More often than not, the manufacturer or company who sells the detector will offer a training guide on how to use it. If so, you might want to consider showing this to your employees. It’ll help them use the detector more efficiently and effectively. Usually, you’ll find a counterfeit money detector right next to the cashier. The point of this is to enable them quick and easy access. Again, this saves a lot of time and effort, which are valuable to any business. However, this means that the detector’s size should be suitable. It shouldn’t take up much space. Larger machines usually can’t be placed next to the cashier. This means that they won’t use it quite as often, which is definitely undesirable. 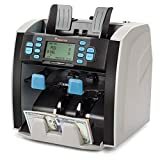 Hence, when choosing your counterfeit money detector, keep your working space in mind, especially the amount of space your cashier has. Here’s a secret: people who design counterfeit money detectors aren’t the only geniuses out there. Some criminals are just as smart. They’re constantly discovering ways to get past even the best detectors, but it takes time. That’s why you should always go for a model that incorporates the latest technology. Older versions are more liable to be beaten by crooks and criminals. Newer models might be more expensive, but they’ll save you money in the long run. That’s why newer models are highly recommended. Cutting-edge technology gives you the smallest chance of being tricked. Also, you should know that you’re not obligated to choose one type of technology over the other. 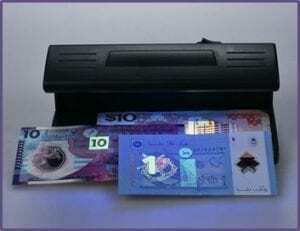 A lot of counterfeit money detectors utilize multiple technologies when evaluating banknotes. Some of the most common technologies include UV detection, magnetic detectors, infrared technology, fluorescent light, and microprinting. One thing to keep in mind is that the government is always introducing new bills that incorporate new security features. That means that your detector should be able to screen both new and old ones. Otherwise, it would be useless, wouldn’t it? Make sure the counterfeit money detector you choose has the ability to scrutinize all these new features. Additionally, consider whether or not the detector can scrutinize different currencies. It depends on your business and inflow of banknotes. Hence, if you’re used to dealing with only one type of currency, then don’t bother looking for more fancy detectors. On the other hand, if your company handles currencies from several countries, then you should take that into consideration when choosing your detector. Make sure the one you choose accommodates the currencies you’re looking for. When choosing your counterfeit money detector, you have to consider how much money you’re going to be screening. If the answer is a lot, then you’re better off going for a high-end detector that can check large amounts quickly. However, keep in mind that high-end detectors are also expensive. If you’ll be moving your detector from one place to another, you should consider portability. Smaller devices are obviously easier to move around. The majority are also designed to work in low-light settings. On the other hand, if you’re going to be using the counterfeit money detector in just one place, then portability shouldn’t matter much. Look for more important features. The number of counterfeit money detectors you need usually depends on your points of sale. If you own a store with several cashiers, then you’ll most likely need several detectors. This will allow your cashiers to check banknotes efficiently and quickly. Faster and more efficient sales in turn correspond to greater customer satisfaction. That means that more detectors might be worth the investment. One could argue that a budget is the most determinate factor when buying pretty much anything. Counterfeit money detectors are no exception. You have to consider just how much money you can afford to spend. Some detectors are very expensive. Of course, the price comes with a lot of features and added security measures, but you still have to think about your budget. If you’re on a tight budget, you can still find decent detectors, but with fewer features. Relying on your eyes to spot counterfeit bills can work sometimes, but not with good counterfeits. And definitely not with large amounts of money. For that, you need a decent counterfeit money detector. If you’re having difficulty choosing one, why not pick one from this list? It certainly covers all types of technologies, business sizes, and budgets. These detectors will save you time and money. After all, aren’t they one and the same?